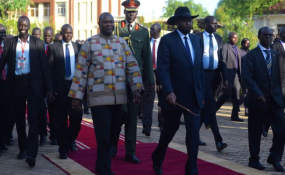 Opposition politicians’ reactions are mixed regarding South Sudan President Salva Kiir’s decision to give amnesty to rebel leader Riek Machar and other groups who have been fighting to topple his government for years. Speaking from Khartoum where the South Sudan peace talks continue, General Nathaniel Oyet Pierino, head of the SPLM-IO’s governance committee, told South Sudan in Focus that Kiir must also free political opponents. "We want this to be accompanied by the release of all political detainees, the release of all prisoners of war. We will only believe that there is a change in attitude if we see all these South Sudanese who are currently under detention by the regime go free and unconditionally,” Oyet told VOA. "We have those who were abducted from Nairobi, Kenya. We have our former spokesperson, James Gadtet. We have Samuel Dong Luak. We have Agrrey Idri. We have Marko Lotpiyo. ... We have Peter Sule. We have all these under government detention,” Oyet said. The president’s amnesty offer went into effect as it was being announced on state television and radio Wednesday night. “We can only believe in a government which is people-centered, which is answerable. There are so many civilians in the camps today, even around Juba. If there is a people’s government, why should people still stay in the camps, even in their state capital? This at least is a good signal that the government is not people-centered, and the people are fearing the government itself,” Mathew told South Sudan in Focus. Kiir’s amnesty offer followed the recent power-sharing and governance deal in Khartoum, which paves the way for a final peace agreement by all parties, to be decided in the future. Some opposition groups “bracketed” parts of the power sharing they did not agree with, such as the number of states and positions of power at the state and local levels.